After a long day’s work and a bit of shopping, I wanted to grab a quick dinner and I was given a raving review by a colleague about Al’s Steakhouse on Elgin St. I walked in and the restaurant was quiet, but not unheard of on a Tuesday evening. It took a couple minutes before I was noticed but then I was politely greeted. I was seated at a table by the front windows as requested. The front area also contains a bar and is a bit brighter than the dining room in the back. 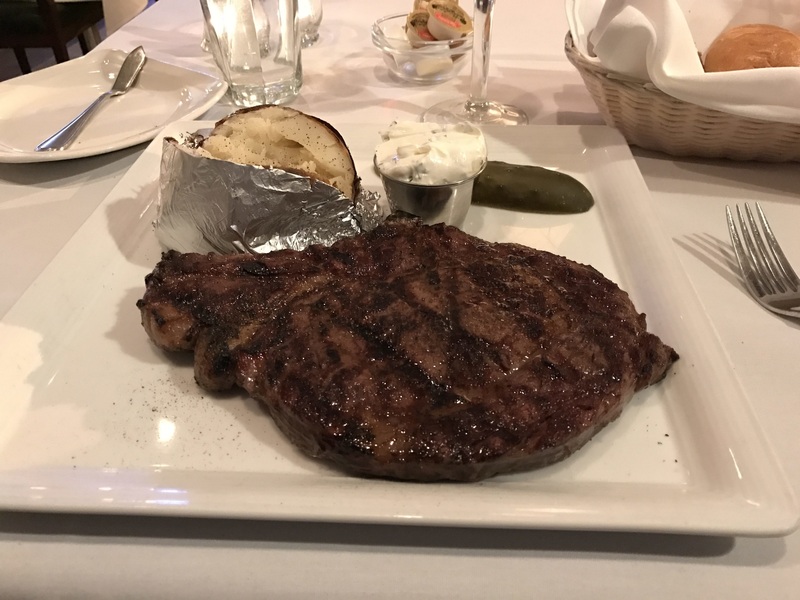 I ordered a glass of Chianti and opted for the “Heart of their reputation”, the 18oz rib steak. Upon ordering I was offered Al’s starter salad, featuring their renowned house dressing or a caesar salad at an additional cost. I opted for the house salad to try the dressing and I ordered the steak medium-rare, the perfect doneness for a rib steak in order to properly render all of its wonderful marbling. A side potato or seasonal vegetables are included so I opted for a baked potato. Despite seeing the selection in the menu afterwards, I wasn’t asked if I wanted the oil and salt or Al’s spice blend on my steak. The price tag of my rib steak dinner was $43. This isn’t a bad price for a steakhouse. When the plate arrived, I was underwhelmed. Having a keen eye, experience in the kitchen and being a steak lover, this plate wasn’t what one would expect from a “steakhouse”. The steak was a thin cut for a steakhouse and the uneven grill marks really toned down the experience. The pickle on the plate seemed really out of place. I was pleased when I cut into the steak to find a prefect medium rare. The waitress came by and I mentioned the steak was under seasoned. I asked if she could get me some salt. She passed me the iodized salt and pepper shakers on the table. I wasn’t pleased, so I asked if they had real salts like the ones you would expect in a steakhouse. She said she didn’t think so. I then asked the waitress to please go check with the chef. Gladly she came back with some kosher salt to help season the steak. Being my first time at Al’s and having eaten at steakhouses around the world, the experience was underwhelming. My suggestions would be to serve thicker cuts, perfect seasoning and offer salts with the steaks for finishing by the client tableside. A day on the Enright Cattle Co. farm! © Takin' a Bite 2018. All Rights Reserved.